The robotic camera rises with the flag on the interactive flagpole. In 2002 we designed an interactive installation as part of an outdoor corporate party. With ten thousand attendees, the organizers wanted to create a feeling of community and connection among the participants. 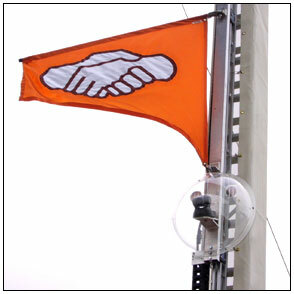 The Power of Holding Hands is an interactive flagpole, activated by participants joining hands. Attached to the flag is a robotic camera, offering a view that changes as the flag rises, from a close-up of the participants to an overview of the entire party. As long as the chain of hands remains connected, the flag stays raised and the camera pans and zooms around the party, providing a virtual tour of the attractions. Design, Electronics: Gorbet Design, Inc.